Back in November 2016, Ken Wedgeworth of Derbyshire won a million pounds plus a free shopping trip to New York when the raffle code on his Euromillions ticket was drawn. Less than half a year later, he reveals how he spent his winnings. 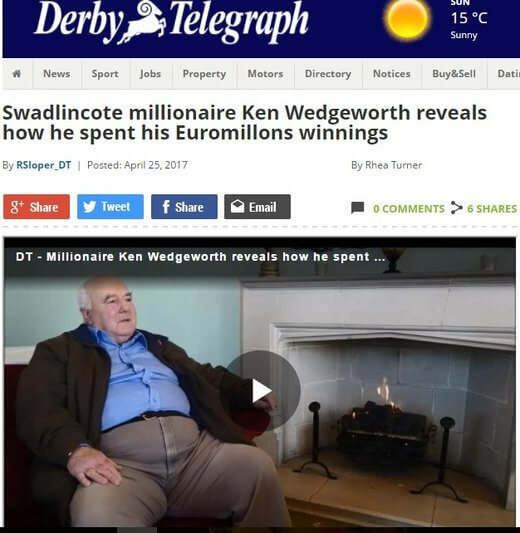 Wedgeworth’s lottery luck came by way of his need to go shopping for milk and bread – he bought a Euromillions ticket too. After his entry won, he even chose the cash option over the New York trip to up his winnings to £1,055,923. Since then he has taken a trip to see the Northern Lights. He says he has not changed much and he’s surprised that some friends actually treat him the same way as before he became a million pounds richer. He says he has also given a lot to charity. Amazingly, he still drives his old Renault, but he has bought an open-plan bungalow for convenience because he has some mobility issues. He says the best thing is not having to worry about money for the foreseeable future. Good to hear charity benefitted. I would give 10% to charity right off the top. Then more to others. You only need so much for you and your family.